An entrepreneur in this day and age is faced with many challenges even before the ball starts rolling. If you’re done creating a product or service and want your target market to know how good it is for them, do you plug in your printer and make flyers? Or do you create a website? You’re a start-up with limited resources. You want your product promoted and you just want to know what marketing campaign is effective. If you’re stuck between traditional marketing vs digital marketing, you are not alone. To be able to choose which concept you should focus on, we are giving you a crash course on both marketing ideas. We’ll dive a little into costing, but we promise to make it easy for you to understand. Our goal is to help you understand online and conventional marketing and empower you to make the proper decision. Read on to learn more about traditional marketing and digital marketing. When we say traditional marketing, we mean promotion through print materials like paying for advertisements in magazines, newspapers, distributing flyers, coupons, business cards and paying for radio ads and TV commercials. Businesses reach out to their target audience to promote and sell their products or services. This conventional method thrives because the general public is familiar with it. And some people are just scared of change. In the case of flyers or pamphlets, the materials are distributed and handed in local supermarkets, parks and what not. The printed advertisement material is kept by the customer and they can go back to checking them out when they’re no longer busy. Another example of conventional marketing are the famous Superbowl commercials. They are just as anticipated as the actual football game. But there are Americans who change the channel right after. Commercials target local audiences. They leave a lasting impression, thanks to the help of celebrity endorsements. If you are targeting a local audience, local radio programs and shows are the perfect avenues for you to promote what you’re selling. Printed ads like flyers and pamphlets take time in production and are costly. Each material needs to serve its purpose in order for the campaign to be called successful. Distribution is also costly. You need to hire people to hand out your materials. Do you have the budget for creating commercials as exciting and interesting as major companies? You’ll pay for directors, set, studio, effects, and so on. Do you want some big Hollywood star to smile while holding your product? Get your checkbook ready then. Face it, not only is making the commercial expensive but it’s also costly to pay for air time. The price range for a 30 second commercial on a major channel will make your eyes pop especially if it’s the Superbowl, Oscars or if it’s during the intervals of a hit show. It’s not eco-friendly. When people aren’t interested in your materials, they just throw it away. Some even litter the streets. It’s a broad concept like traditional marketing. The difference is it makes use of digital technology including blogs, websites, social media and online ads to promote a brand, product or service. Another difference is in this framework, customers reach out to businesses. It isn’t just the age of computers and connectivity – it’s also the age of mobile phones. We not only use it to make calls and send messages. It has become an integral part of our daily lives. Our preferred medium for information and entertainment has changed. Everything is online now, even television sets. Shopping is now preferably done online, hassle-free, thanks to the rise of online retail stores. From production to airing, commercials prices vary and can be costly – $90 to $2,500 per commercial, from local to national TV. Superbowl commercials cost $2 million to $3 million. On the other hand, pay per click at Google AdWords is $1-2 and you only pay when someone interacts with your ad. Meaning you are paying to reach out to only people that are genuinely interested in your service / product. According to a recent study by the Pew Research Center, American buyers are incorporating digital advancements into their buying habits. Approximately eight out of ten Americans are online shoppers. More than half are using their mobile to shop. You can’t track live information of how many households are watching your commercials on TV. Only rough estimates can be calculated regarding how many people may have passed by your billboards. Still, it’s hard to tell whether those who’ve seen it made a purchase. But you can track the number of site visitors you have anytime of the day. You can measure the effectivity of digital efforts easily. How many liked your posts, shared it, commented on it and so on. Online ads have real-time results as well. Customer feedback and reviews are the most reliable testimonial to any product or service. Improve your existing products or create services tailor-fit to their demands through the information you gather online. Your customers can be your ambassadors when they discuss how satisfied they are with your product. Interactions with customers on sites like Facebook provide valuable information. The same goes with Twitter and other social media sites. Any (#) hashtag discussions of your brand and offers is a means to reach out to you. 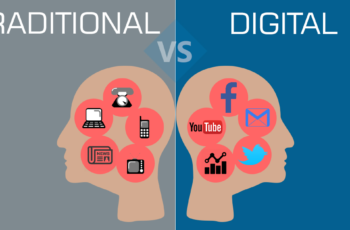 If you compare traditional marketing vs digital marketing, you’ll see the advantages of going digital as a great way to cope with the fast-paced present time and available technology. Search engine optimization (SEO) is creating content that answers or responds to questions asked through search engines. Getting your blog post or website ranked among the top answers in your business niche will direct potentials customers to you. You don’t pay the search engine to advertise your business. Search engine marketing (SEM) is related to the first item. This is getting traffic and visibility through paid search listings. Once someone asks through Google or Yahoo, the results will feature your business on top of the results – as advertisements. Content Marketing is all about creating quality content that will attract its own specific audience. It’s like passing by a great story being told and you sit down and listen to because it piqued your interest. This converts site visitors into buyers effectively. Social Media Marketing (SMM) are advertisements on social media platforms like Facebook, Twitter, Tumblr, LinkedIn and more. Through these sites, you can promote your product, service, and business to its millions of members. Pay-per-click advertising (PPC) is a strategy where advertisers pay for each click on their ads. You bid on keywords specific to your niche to have your ads on top of results. Affiliate marketing is paying your affiliates for the traffic they drive to your website. Through this, you can rest easy and have your affiliate sites do all the work for you. Email marketing is a form of direct marketing where a business reaches out to possible customers through email. Time and tested traditional business strategies cannot be disregarded because we have the internet and mobile phones. Traditional marketing vs digital marketing both have advantages although the latter is proving quite efficient and up-to-date with the customers’ preferences. Our recommendation is to make use of both traditional marketing vs digital marketing concepts. Your business needs a website and social media presence. However, it won’t hurt to supplement your digital campaigns with traditional methods.